Remain disciplined to your system then the system doesn’t work !!!!! Did a lot of stocks fall 40% last year? Tax-Filing in 2019: What’s My Tax Bracket? U.S.News & World ReportJanuary 11, 2019Determining which tax bracket your income falls into is surprisingly complex. But performing this calculation can be instrumental in helping you find strategies to reduce your federal tax bill and double-check any calculations done by a tax-software program or tax preparer. Taxpayers in 2019 should know that the Tax Cuts and Jobs Act generally reduced tax rates. But they should also note that the increased standard deduction and loss of personal exemptions, among other factors, will impact the calculations used to determine the tax bracket into which their income falls. In general, there are seven tax brackets for ordinary income — 10 percent, 12 percent, 22 percent, 24 percent, 32 percent, 35 percent and 37 percent — with the bracket determined by filers’ taxable income. The federal government uses a progressive tax system, which means that filers with higher incomes pay higher tax rates. It’s also graduated in such a way so that taxpayers don’t pay the same rate on every dollar earned, but instead pay higher rates on each dollar that exceeds a certain threshold. — Identify your filing status. — Explore the income tax brackets for 2019. — Understand the marginal rate vs. effective rate. — Consider ways to lower your tax rate. Read on for additional information about each of these tax-filing processes — and how to use them to reduce your bill or increase your tax refund this year. The status you’ll use will depend on whether you’re single or married, have qualifying dependents and other aspects of your specific tax situation. Many married couples file taxes jointly, but some may choose to file separately to reduce their student loan payments or because they’re in the process of divorcing. Full disclosure: This step is difficult to do by hand, but it can be a worthwhile exercise. First, calculate earnings from your work, investments, alimony, rental properties and other sources, then subtract any income that is considered an exclusion by the tax code, such as proceeds from a life insurance policy. That calculation will yield your gross income. “Gross income is pretty much everything, and it’s defined in the law as income from all sources unless there’s an exception in the tax code,” says Chris Raulston, a Memphis, Tennessee-based wealth strategist at Raymond James. Next, you’ll subtract certain tax adjustments, such as student loan interest and contributions to an individual retirement account, or IRA, to figure out your adjusted gross income. Feeling tired? You’re not done yet. After determining adjusted gross income, you’ll need to subtract tax deductions. That involves deciding whether to take the standard deduction ($12,000 for single filers; $24,000 for married filing jointly) or itemize, which you do by manually subtracting below-the-line deductions, such as charitable contributions and mortgage interest. Finally, you’ll have reached your taxable income and can start to determine your tax bracket using this number. To complicate things, certain investment income is taxed at a capital gains rate and not at the ordinary income rate. So, keep that in mind as you do this exercise. Find the range into which your taxable income falls (remember, that’s after taking out adjustments and deductions) to determine your 2019 tax bracket and corresponding rate. Say you’re a single filer who earned $50,000 in 2018 in taxable income. You’ll use the table to determine that you fall into the 22 percent tax bracket, which is known as your “marginal rate.” But that doesn’t mean you pay 22 percent of every taxable dollar to Uncle Sam. “Just because your income may fall into the 22 percent or 24 percent tax bracket, it doesn’t mean all your income is taxed at 22 percent or 24 percent,” says Mark Jaeger, the Cedar Rapids, Iowa-based director of tax development at tax software company TaxAct. Your total tax liability will be the total of those amounts, or $6,939.50, which is a nearly 14 percent effective rate. To lower their tax bill, filers may want to use strategies to place themselves in a lower tax bracket, especially if their taxable income falls right on the cutoff line between brackets. Before the end of the tax year is the best time to consider moves such as delaying income or making contributions to certain accounts, such as health savings accounts and retirement funds, experts say. But there is one more move they can make after Jan. 1. “Now that we’re in 2019, making those moves is starting to wind down,” Jaeger says. “But you can still make that traditional IRA deduction through April 15.” So if you’re looking to reduce taxable income for the taxes paid in 2019, make this retirement plan contribution before filing your taxes. Work with your tax preparer or financial advisor to identify additional ways to lower your tax bracket. A financial professional may suggest “bunching” deductions in 2019, for example, to qualify to make itemized deductions and lower your tax bill. 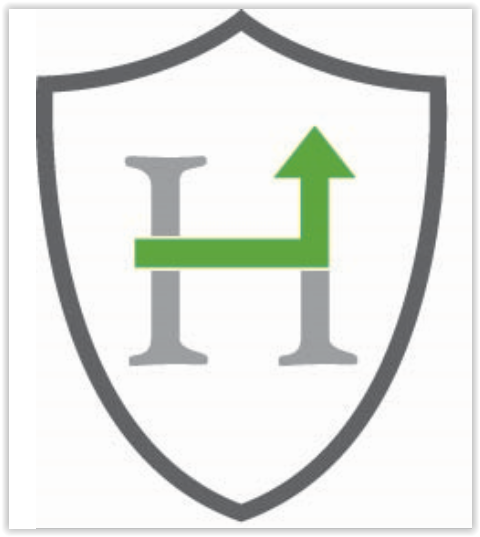 Bottom line: Knowing your tax bracket will help you better understand your tax bill and how to reduce it. In late 2018, FedEx (FDX) gave investors the first major indication of troubles about the global economy, with company management saying its international business had “weakened significantly since we last talked with you during our earnings call in September.” Adding that, “China’s economy has weakened due in part to trade disputes.” FedEx cut its outlook for 2019 as a result. Convinced the stock rout is over? It has occasionally felt like it, on days like Friday, when the Dow Jones Industrial Average soared almost 750 points. Isolated examples of quickrebounds loom large in the minds of traders, or at least those whose careers go back more than a few years. But even in a benign scenario — one in which a bear market is avoided and the Boxing Day low in equities is preserved — it’s wise to remember that bottoms usually take much longer to form than they have so far in the S&P 500 Index. Here’s the data: since 1950, the S&P 500 has endured 11 retreats of 12 percent or more that happened in prolonged bull markets such as the current one, according to Bank of America. While the average decline of 19.9 percent matches the latest sell-off that started in October, the corrections have typically lingered for much longer — eight months, on average. In other words, even if a market bottom is close in terms of equity prices, it may be too early to call all clear yet if history is of any guide. As much as bulls are hoping President Donald Trump is right — that the worst December since the Great Depression was merely “a little glitch” — past patterns suggest it isn’t that simple. That kind of bounce is happening now. Fueled by its post-Christmas rally and Friday’s surge, the S&P 500 climbed almost 8 percent in seven days, capping its first back-to-back weekly gains since early November. The rebound, coming after the benchmark fell within points of the 20 percent bear market threshold, is reminding some investors of two previous near-death experiences. In 1990, the S&P 500 plunged 19.9 percent in three months through October only to erase all the losses four months later. In 1998, the market took a similar dive in a matter of weeks, and again, the decline was all but forgotten in two months. Will stocks repeat this time? They certainly could. But large-scale market dislocations seldom end swiftly. Assuming stocks had bottomed on Dec. 24, this sell-off would rank as the fourth-fastest among the 11 pullbacks tracked by Bank of America. But if it matches the average length of the past routs, stocks would face more pain into the second quarter. The S&P 500 revisited what were then 10 percent declines in October and November — and they didn’t hold. Now, past support levels have turned into hurdles. 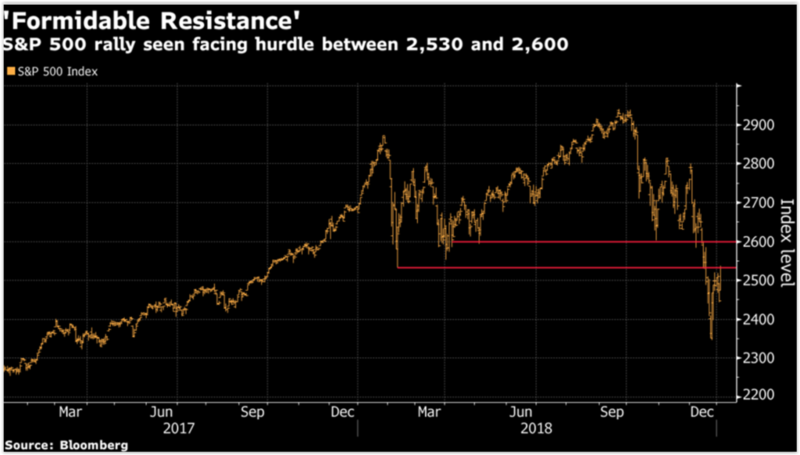 The range between 2,530 and 2,600 represents “formidable resistance” for the S&P 500, according to Jonathan Krinsky, a technical analyst at Bay Crest Partners. 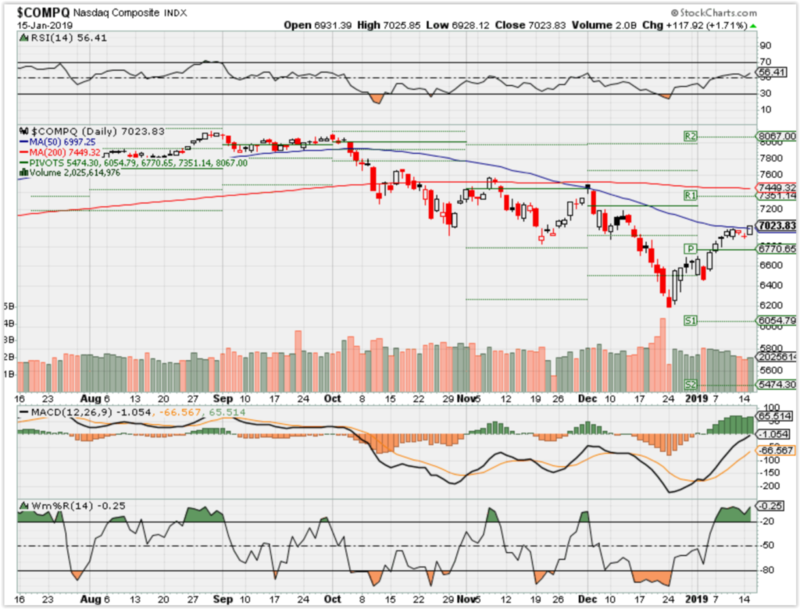 The former marked the market’s bottom in February while the significance of 2,600 can be seen from its ability to have stemmed losses in May and October. 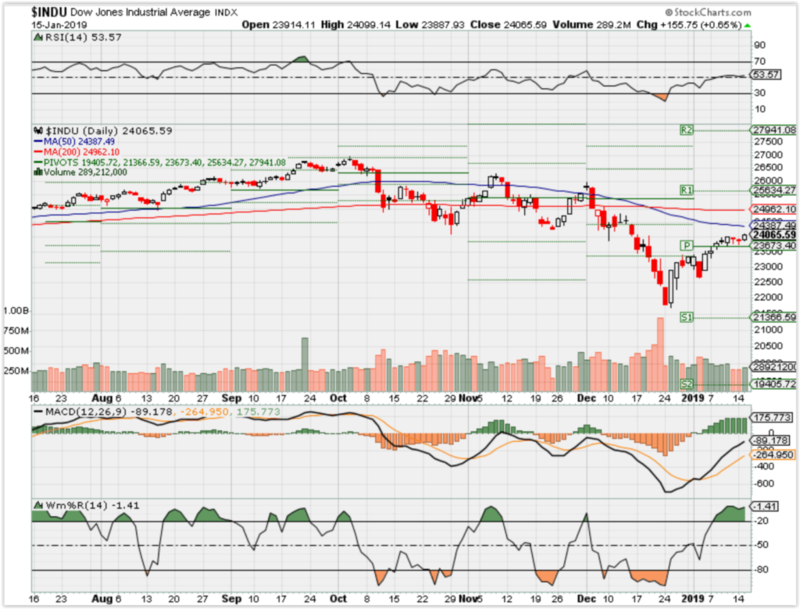 After attempts to top 2,530 failed on Dec. 28 and again on Jan. 2, the S&P 500 finally broke the threshold Friday. 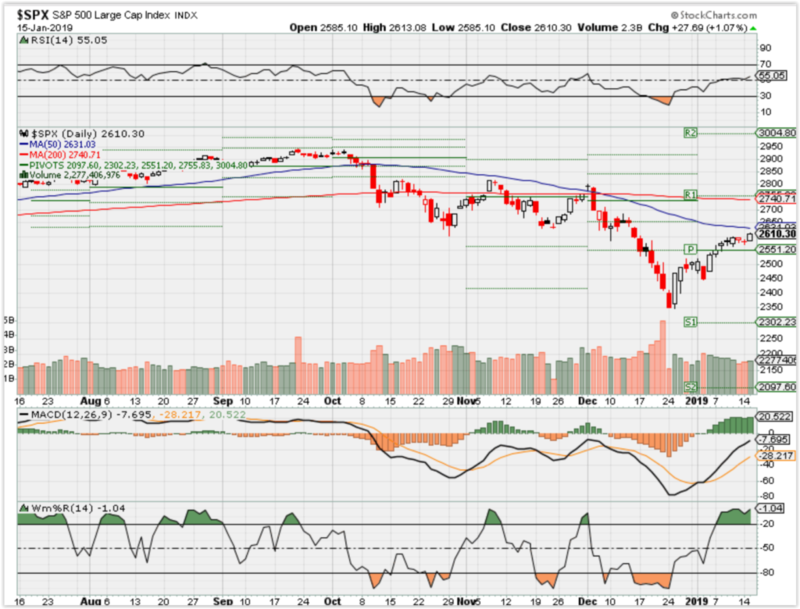 Still, at 2,531.94, it stood one point below February’s intraday low. To Rob Ginsberg at Wolfe Research, a dip to 2,200 on the S&P 500 during the first quarter is “a fair bet”.